The Nations of the world have gathered in London for a UN Convention on Biodiversity and Climate Change. According to the Secretary, “A UN-backed study estimates the loss of natural capital due to deforestation and land degradation alone at between $2 trillion and $4.5 trillion each year.” Environmental protection and economic protection are two sides of the same coin. He urged member states to invest in sustainable development, which will assist indigenous people to protect the biodiversity in developing countries and meet the Millennium Development Goals of food security, poverty eradication and world health and to build resilience to climate change. Biodiversity and climate change are mutually interdependent. Continued deforestation, over-fishing, industrial agriculture, and introduced invasive species will continue the high rate of extinctions and loss of habitats and exacerbate climate change impacts. Programs as the UNDP Equator Initiative, and the Global Environment Facility Small Grants Program have been put in place to provide assistance. Norway has pledged 500 million to prevent the deforestation of the rainforest for monoculture crops within rainforest settings. The Amazon forest will reach a tipping point if 20-30% of the forest is cut or burned creating savannas prone to drought cycles and fire. Today 17% of the Brazilian rainforest has been cut and burned. According to Veerle Vandeweerd, UNDP Environment and Energy Group, three quarters of the world’s population rely on the natural environment for survival. 1.5 billion people live in dry lands and 1 billion people rely on sustenance fishing. There is a need for poverty reduction and biodiversity protection. We need a new strategy that links climate change, biodiversity, and the Millennium Development Goals with concrete targets and implementation in cooperation with the developed and developing countries. According to Stas Burgiel in Convention on Biological Diversity: a progress report, “The UN Convention of Biological Diversity (CBD) is the single most important international agreement designed to protect the world’s biodiversity, to encourage the sustainable use of biological resources, and to ensure the fair and equitable sharing of benefits derived from such use.” The Convention was signed at the Rio de Janeiro, Brazil 1992 Conference on Environment and Development- known as the Earth Summit. The Cartagena Protocol on Biosafety was adopted on 11 September 2003. It establishes rules under which crops and other organisms, which have been genetically modified, can be transferred from one country to another. According to Stas Burgiel’s Convention on Biological Diversity: a progress report- “The United States was perhaps foremost among developed countries in resisting potential restrictions on biotechnology and intellectual property rights. Indeed, President Bush (senior) refused to sign the CBD at the Earth Summit in Rio. Although President Clinton signed the Convention two years later, so far, the United States remains one of a small handful of countries that has not ratified the agreement, and so has refused to frame its own national laws in line with the CBD.” Policies must be put in place to protect indigenous knowledge of medicines and cures from the extractive and exclusive corporate explorers who patent local knowledge without proper recompense. The Fifth Meeting of the Conference of the Parties, (COP-10) and the Cartagena Protocol for Biosafety, (COP-MOP 5) will be held in Nagoya, Japan on 29 October 2010. Perhaps the cataclysmic loss of life within the coastal ecosystems of the Gulf of Mexico broadcast around the world will galvanize our President and members of Congress to act responsibly to represent the best interests of her people on this blue planet we share with all life in this time of crisis. The nations of the world must be united and just if we are to come to a common accord to exercise our collective Rights of Responsibility, to protect and restore Earth’s biodiversity from potential extinctions and the effects of climate change. A welcome has been extended to the United States to join the Family of Nations in this Year of Biodiversity. Joseph Ingoldsby, writes and advocates for biodiversity. Recent works include Vanishing Landscapes and Endangered Species, The Science Exhibition: Curation & Design, Museums etc Press, UK, 2010; Icons of the Vanishing Prairies, 2009; Vanishing Landscapes: The Atlantic Salt Marsh, Leonardo Journal, 42-2-2009 MIT Press; and Requiem for a Drowning Landscape, Orion Magazine, March/April 2009. Centre for Coastal Environmental Conservation (CCEC), an NGO celebrated the International Mangrove Action Day (26th July) -2010 at Burigoalini Union adjoining Burigoalini Forest Range Office at Shyamnagar UPZ under Satkhira District of Bangladesh. The CCEC organized a rally with the active participation of Mangroves Protection Society (MPS) members and Sundarbans stakeholders i.e. bouali (wood and thatch cutter), mouali (honey extractor), jellay(fish and crab catcher) cooperative society members. The rally moved around Datinakhali Nil-Dumur BDR/BGB Camp and Burigoalini key areas including plantation site followed by a discussion and circulation of posters and leaflets at “Sundarbans Information and Tourism Promotion centre” run by CCEC. Discussion includes on the important roll and potential of Sundarbans mangrove forest. Mangrove safe our life especially during catastrophic cyclone for example cyclone-SIDR, and cyclone-AILA. The Sundarbans mangrove is the remaining natural coastal defender of Bangladesh and acts like a mother. They also mentioned that Sundarbans mangrove is a source of livelihood, food, fuel of coastal communities and ideal habitat for biodiversity. 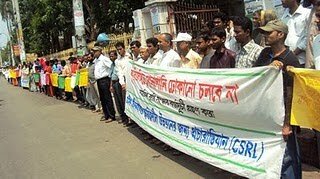 They commit that the Sundarbans must be protected in cooperation with all concerned. The meeting was attended by Forest Officials, CCEC field supervisors Shamir Kumar Dhali, Nirapado Mondal, Nur Islam. The meeting was also represented by Mr. Shamsur Rahman the Chairperson, stakeholder cooperative society and mouali group leader Mr. Mostofa Sardar who spoke on the discussion meeting. As part of UNEP-APFED Showcase project, titled “Sundarbans crab fattening in bamboo cages and mangrove restoration as an adaptation to climate change” funded by Thailand Environment Institute (TEI).